A collaboration between The School of Education and School of Therapeutic Sciences, eZone promises to offer 21st century learning. 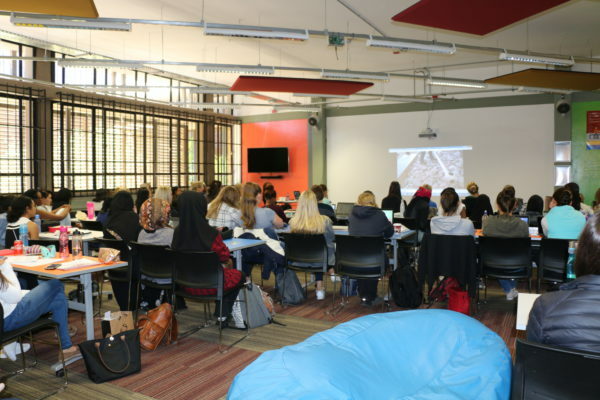 THE WITS School of Education and School of Therapeutic Sciences launched eZone on Wednesday, September 20. The eZone is an interactive environment for students to learn while using technology. The facilities are now accessible to both students and lecturers of both the schools. This collaborative effort has afforded students a new environment to work in. Janine van der Linde, who is the institutional designer and lecturer told Wits Vuvuzela that, eZone offers students laptops and iPads on a loan basis with the required programmes to be able to get their course work done. Students can also use the equipment for study purposes.The eZone also includes a teaching area which allows for lectures to take place with use of the laptops and iPads. Van der Linde said there are 80 laptops as well as 40 tablets and iPads. “All the equipment is movable, nothing is static. So we can move the room in such a way that one can either work alone or in groups,” van der Linde said. One of the main purposes of the space is to teach students to be able to use technology in their fields of study, she added. A third-year occupational therapy student, Sandra Khan, said that the eZone is different to a library as it allows for group discussions to take place. However, the environment is also structured making it appropriate to study. Khan said occupational therapy has a lot of group work activities and the eZone provides a place to get the work done. Another third-year student, Daphne Grewe said, “You can just scan equipment out at your own leisure, there is no need for assistance.”Students enjoy the relaxed environment that the eZone provides, it is not as rigid and structured as a library or computer lab. There are bean bags and students are allowed to write on the wall while they study. eZone can be found on the Education Campus in Parktown. For now the space can only be used by the School of Education and the School of Therapeutic Science students and staff.